After the success of my last post about my simple razor-blade radio (link here), I began work on making a slinky dipole. I tried to use 2 Slinky Jr. toys which I bought at Walmart for $.88 each. It didn't work as well as I had hoped. After quite a while of the coils sitting on my desk and playing with them, it dawned on me that I could easily use the small Slinkys as the tuning coil for a simple radio. I started to do the math to find the inductance of the coils. I measured 1.5" in diameter, which gave me 4.7" in circumference. I started to count the coils to calculate the open-air coil formula that I had used before. I stopped and thought, why bother? Just try it out! I stretched the slinky to the length of the board I used on the old razor-blade radio and tacked it down. I made the proper connections, using a diode first. (Ground went to the 3rd prong on a power outlet, the antenna wire and clip was hooked to my 20m ham radio antenna, on my roof) I started with the diode because it is far more efficient than the razor blade, which equates to louder audio in the earpiece. Right off the bat I was able to hear shortwave broadcast stations! Wilder still was my ability to receive the signal without having the antenna clip attached! I tried various points along the coil, finding I was able to hear certain stations better at different points on the coil. As before, I was able to hear local AM broadcast stations just fine, and various strong shortwave stations with a "shorter tap". After listening with the diode for a few minutes, once again amazed at the simplicity of the setup, I switched to the razor blade setup I had used in the past and was just able to pull out the same local broadcast signal from before. The key to using the razor blade/saftey pin is using a pencil lead wrapped soldered to the pin. Then ever-so-lightly "fishing" for the sweet spot on the razor that allows the signal to pass. It's also important to note you'll need to be in a fairly quiet environment to hear the signal, but if you listen - it's there. So now you have no excuse but to find a crystal set earpiece, the coil has been made for you and it'll cost you under a dollar to buy. Alligator clips help, but as you can see, are not 100% necessary. Also note at the top of the picture is the old coil from my last setup. 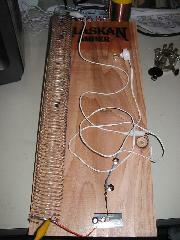 #971 wow this is great your idea for simple dipole works.